Who is the real Nigel Farage… and why won’t he answer my questions? The first time I call Nigel Farage live on air on his LBC radio show, I give my real name. It’s Sunday 10 June 2018, the day the Observer reports that Arron Banks, the main funder of Farage’s Leave.EU campaign, had not one (as he had claimed), but several meetings with the Russian ambassador in the run-up to the EU referendum. “What do you want to say to Nigel?” the producer asks. “I want to talk about how the funder of his campaign has systematically lied about his relationship with the Russian government,” I say. “I can’t put you through,” the producer says, an edge of panic in her voice. “Come on,” I say. “You’re a journalist. You know these are important questions. “I’m standing in,” she says. “I’m not the usual producer.” She promises to speak to her editor and call me back. No one calls me back. Two days later, I try again. Banks and his business partner Andy Wigmore, the spokesman for the Leave.EU campaign, are on the show to “answer questions”. It’s an interview in the best traditions of a Stalinist show trial – the man asking them the questions is the man whose campaign they funded – but even so, they sound spooked. It’s the only occasion in my time of reporting on them that I’ve heard them so subdued and serious. There’s never been an issue with me discussing Farage on other LBC shows such as James O’Brien’s, but, again, I can’t get through. Minutes later, a friend does, and passes me the phone. Actually, I say, just as Farage has built up a head of steam about the Trump-Russia “witch hunt”, it’s Carole Cadwalladr from the Guardian and Observer. “I don’t want to talk to Carole Cadwalladr of the Guardian!” Farage says. In the video of the moment, you can see him frantically motioning his producer with his eyes. The phone line is cut. Nigel Farage is so regularly on our airwaves and quoted in the press, but he is rarely held to account. At this point I’ve been writing about him for almost two years, and I have no way of asking him questions. His PR man almost never responds to messages. Doesn’t respond to interview requests. And then on 7 September this year we finally meet. He’s on tour with a one-man show entitled An Entertaining Evening With Nigel Farage, which has just landed – somewhat bizarrely – in Melbourne, Australia. Everything is a bit different here. The day before the event, I receive a notification of a change of venue (were ticket sales perhaps not what Farage might have hoped?). The event has been moved from a mid-sized arena to the conference room of a city centre hotel. What’s more, to get in, I have to fight my way through what feels like a running street battle. In Melbourne, Farage isn’t known as the Ukip man off the radio and telly. “He’s Donald Trump’s fascist sidekick and we don’t want his type here,” claims one of the protesters. He’s holding a placard that depicts Farage as a pig. Inside, it’s different. The audience – overwhelmingly male, surprisingly young – laps up his well-rehearsed bonhomie. And afterwards, for an extra A$200 on my ticket fee, I get to hang out backstage with a select crowd drinking bad white wine. And then, here he is. Hello, Nigel, I say, and introduce myself. He blinks. But, he doesn’t flee for the exit. Not straight away. It’s been frustrating, I say, because I’ve just wanted to ask you some direct questions. Will you do a proper interview with me? No, I say, but you’re a public figure. You’re funded by taxpayers. The European Union funds you. We pay taxes that pay for you. “Well, who funds you?” he says. “The Observer funds me,” I say. I can’t quite believe that he’s said this, apparently in all seriousness. Banks has also accused me of being funded by Soros. And I’ve heard Farage using the phrase in the European parliament. It’s a reference to George Soros, the Hungarian-born investor and philanthropist, who after the fall of communism, funded democracy-building institutions and movements across eastern Europe. He became a hate figure to the Russian government, who launched a propaganda campaign portraying him as a meddling Jewish banker. Watch video of the moment Nigel Farage hung up on Carole Cadwalladr. What “funded by Soros” really means is: “funded by Jews”. It signals antisemitism to an audience without saying it directly. But the only audience is me. I’m gobsmacked. Could he actually believe this stuff? And then his minder appears. I have moments to put my question, the question that kicked it all off. Why did you visit Julian Assange? I say in a hurry. It’s the briefest of brief encounters and yet our exchange is so instructive. Because from the Kremlin, “Soros” as a political smear spread to the likes of Hungary’s demagogue-in-training, Viktor Orbán, and was picked up a year ago by Farage. When the Electoral Commission opened an investigation into the sources of Arron Banks’s funding a year ago, Farage made a speech in the European parliament in which he blamed this development on Soros. “This is where the real international political collusion is.” From Britain, it leapfrogged to the US, where it’s been deployed by Trump supporters about the “caravans” of immigrants heading for the US border with Mexico. Last week, it descended to the final circle of this hell: Facebook. The New York Times reported that after the Cambridge Analytica scandal, Facebook hired a right-leaning opposition research firm who used accusations of “Soros funding” to smear the company’s critics. In a way, the anti-Soros propaganda illuminates everything I’ve been trying to understand about Farage’s place in today’s world: that he represents a bridge between the authoritarian far right parties of central and eastern Europe that are aligned with Russia, and Trump’s America. It all feels a long way from West Kent golf club and the undulating greens outside Farage’s childhood home. His autobiography describes his time at Dulwich college from 1975 to 1982 (he left the public school with few if any O-levels – accounts vary), and how a meeting at the golf club led to his first job as a commodities trader on the London Metal Exchange with a minor City firm. For years, this has been the image that Farage has cultivated. The tweed jackets. The pints. The Little Englander who lived modestly in a Kent suburban home and spoke to Britain’s G&T belt. Even in 2014, he said in an interview that he realised he must reach beyond his core base, which he describes as “very middle class, very below the M4, ex-military”. This is no longer Farage’s world. He left that world far behind some time ago. But there’s a time lag in Britain in understanding this. In understanding Farage’s relationships with the European far right. And in understanding that he’s using the same playbook as the Kremlin, Steve Bannon (Donald Trump’s former chief strategist) and Robert Mercer, who for a long time funded Bannon’s pet projects, including alt-right news site Breitbart, and Cambridge Analytica. Here in the UK, Farage is still cosy Mr Brexit. He’s been touring the country running “Leave Means Leave” rallies – I went to one in a retail park in Bolton – where talk of medicine running out and lorries backed up on the motorway was denounced as yet more “Project Fear”. He’s the man who holds fast to an ideologically pure Brexit vision untainted by the realpolitik of Theresa May’s compromises. The man who broadcasts live on LBC five times a week and pops up on the BBC. Critically, in Britain, where political coverage follows the beat of Westminster’s drum, we have yet to really catch up with Farage’s uncomfortable new position: in overlapping circles radiating from US special counsel Robert Mueller’s investigation into Russian interference in the 2016 US election. Could this be why Farage is avoiding me? He has refused to answer my questions for more than 18 months, since I wrote a report for the Observer – headlined When Nigel Farage met Julian Assange – published on 23 April last year. It posed a series of questions to which there are still no clear answers. Questions that, it’s become increasingly clear, cover some of the same territory that Mueller is circling. The visit had come shortly after Farage had visited Donald Trump in Washington. BuzzFeed’s story involved three individuals, Trump, Assange and Farage, who were at the centre of the political storms that had changed the world in 2016 and raised a new set of questions. It was the timings around the visit that raised questions. Farage left the embassy around noon. BuzzFeed’s story appeared at 1.31pm. At 2.28pm WikiLeaks made an announcement: it would host a live press conference with Assange about his latest leak, “Vault 7”, about mass CIA surveillance. This was during a week when things had started to look serious for Trump. Jeff Sessions, Trump’s attorney general, had been caught lying under oath about two meetings with the Russian ambassador and recused himself from the Russia inquiry. The “Vault 7” story , which landed US tech companies in the middle of CIA cyber-espionage, erupted on to the news cycle. It blew Russia off the front pages. We don’t know if Farage is involved in the Russian intelligence operation that Mueller is so painstakingly unpicking. The investigation is in lockdown. But we know almost certainly that Assange is involved. An FBI indictment unsealed on 13 July said that at the heart of Russia’s operation to subvert the US presidential election is “Organization 1”, widely reported to be WikiLeaks. It’s Mueller who’s identified this. It’s the FBI indictments that reveal that so many strands of the investigation run through London. The third time I call Farage at LBC is 1 November 2018, the day Arron Banks is referred to the National Crime Agency because the Electoral Commission had decided it can’t be sure of the source of Banks’s multimillion-pound donation to Farage’s Leave.EU campaign. Or even that it came from Britain. This time I’m “Claire from Ashford, Kent”. I’ve been thinking about Remembrance Sunday, I tell Farage. “It’s a real time to feel patriotic about our laws and sovereignty,” I say. “It certainly is,” says Farage. “It’s why I’m so concerned about these reports about not knowing where Arron Banks’s money comes from,” I say. “I’m not discussing spending in the referendum here and now, Claire!” says Farage. The line goes dead. This is Steve Bannon’s language. The language of “globalists” and what Bannon pitches as an all-out war against the “elites”, an all-out war he’s now bringing to Europe with his latest project, a pan-European far-right coalition that he calls the Movement. “Farage has always followed the money,” a Ukip insider, who wishes to remain anonymous, tells me. “He knows which side his bread is buttered. When the US alt-right and evangelicals started supporting him, he became just like them.” And when I ask Greg Lance-Watkins, another key ex-Ukiper, how he’d describe his ideology he says: “Farage’s ideology is Farage.” In the 90s, Lance-Watkins used to advise Farage before his Question Time appearances. “He’s scared of the trick question. That’s why he won’t speak to you. But then neither do I.
It’s an eye-opening moment. Jordan Peterson is the Canadian psychologist whose forthright views on women and why feminism is wrong have made him an alt-right YouTube breakout star. YouTube’s algorithm had connected him to Farage. 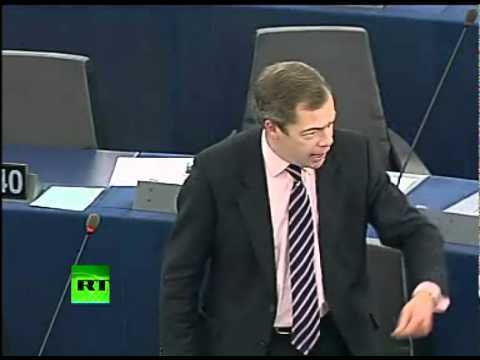 One of RT’s many uploads of Farage speeches in the European parliament. I watch the speeches. They have titles like “Who the Hell [sic] You Think You Are? Nigel Farage throws egg in Eurocrat faces.” And “Can’t Barrage the Farrage [sic].” They’ve been viewed millions upon millions of times. It’s these YouTube set-piece speeches, pumped via the site’s algorithm to the phones and laptops of an entirely new generation, that are Farage’s power base now. And, at the centre of this, is RT (formerly Russia Today), the Kremlin-controlled English-language broadcaster. RT made Farage a YouTube star. Much of this story, like Arron Banks’s relationship with the Russian ambassador, is hidden and covert. But there’s also much that is out in the open, like Farage’s support of pro-Russian parties in the European parliament, and his association with RT. RT recognised Farage’s value way back in 2011. An ex-Ukip insider tells me how RT’s London correspondent “practically lived inside Ukip’s offices. They targeted Gerard Batten first [the current leader of Ukip] and then Farage. They loved it. RT would ask them on every week. They’d talk about anything.” Batten did not respond to the Observer’s questions about his relationship with RT. All this is out in the open, but the Observer has been shown emails that reveal something new. The person who used to upload Farage’s videos to YouTube was an EU parliament staffer called Kevin Ellul Bonici. According to a Guardian report last year, sources inside the European parliament said Ellul Bonici – who did not respond to the allegations – was “a frequent visitor to the Russian embassy”, after which he would return with “a bootload of propaganda”, and was subject to an internal investigation. The new emails seen by the Observer show that Bonici was uploading content not just to the official Ukip channel but also uploading it “on a private channel” for “the many fringe websites”. There is no evidence that Farage knew about Ellul Bonici’s alleged relationship with the Russian embassy. When asked about all of the issues in this article, a spokesman for Farage said: “Mr Farage has no desire to speak to you under any circumstances.” The Observer could not reach Ellul Bonici for comment. The Observer has also learned new details about a meeting between Nigel Farage and Roger Stone. Stone is the extraordinary peroxide-blond 66-year-old dandy, a self-styled “dirty trickster” who’s played a key role in many political scandals since Watergate, and who is central to Mueller’s Trump-Russia investigation. On 8 August 2016, Stone told a small crowd that he’d been in touch with Assange. There would be a WikiLeaks “October surprise”, he suggested, about “the Clinton foundation”. In later comments he correctly forecast both the source of the leak and the timing of it. It is this claim to have knowledge of WikiLeaks’ material – before WikiLeaks released it – that is believed to have piqued Mueller’s intense interest. Mueller is looking at timings of all this. The timeline of who knew about WikiLeaks’ stash of emails from Democrat accounts, and when. Emails that we now know were hacked by the Russian government and that threw the presidential race into chaos just days before the US presidential election. Stone and his associates have been questioned by Mueller many times. Some of those associates of Stone are Farage’s associates too: InfoWars journalist Jerome Corsi, Steve Bannon and the controversial academic Ted Malloch, once tipped by Farage to be Trump’s ambassador to the EU. Stone makes his own appearance in the timeline. One of the film-makers behind the brilliant 2017 documentary Get Me Roger Stone, Daniel DiMauro, spoke to me about a meeting that he witnessed between Stone, Alex Jones and Farage during the Republican National Convention, 18-21 July 2016. “Stone had arranged to have dinner with Alex Jones and Nigel Farage,” he tells me. And they followed him with the camera crew. “But we got to the restaurant and Farage’s people were: ‘No, no, no! You can’t film. You can’t film.’ It was weird. Jones and Stone were totally open to it. But Farage was ‘No way’. He didn’t want any record of it. We didn’t know what to make of it. Another member of the crew told me: “It was the first time that Alex Jones, Roger Stone and Nigel Farage met face to face. We’d had a wire on Roger everywhere we went but when we turned up to meet Farage and his guy, he [Farage’s aide] was absolutely adamant. Less than two weeks later, on August 4, 2016, Roger Stone would also go on Alex Jones’s radio show and trail a new release. There would be “proof” of a scandal involving “Clinton Foundation”, a new “devastating” leak. “I think Julian Assange has that proof,” he said. If you had to pick another extraordinary story about Nigel Farage’s associates, George Cottrell would have to feature. Aged just 22, he was appointed Farage’s aide and Ukip’s chief fundraiser during the Brexit campaign. The two were at Chicago’s O’Hare airport on 22 July, 2016 – the day after the Republican convention in Cleveland at which Farage met Jones and Stone. Cottrell was subsequently charged with 21 offences, including money laundering, fraud, blackmail and extortion. He pleaded guilty to one of them and was released after eight months in jail. In an interview with the Telegraph, he explained how he’d learned about “the murky and complicated world of ‘shadow banking’” and had worked for “an offshore private bank” that was “under investigation by the US authorities as a foreign financial institution of primary money-laundering concern”. There is no suggestion in the charges that this was linked to Ukip. Cottrell did not respond to the Observer’s attempts to reach him. The fourth time I call Nigel Farage’s LBC show is just a week ago. Late on Saturday night, the Observer published its latest revelations about Arron Banks and the Leave.EU campaign. An academic from Essex University, Emma Briant, had obtained emails from a Cambridge Analytica employee which revealed that Banks had sought Steve Bannon’s help in soliciting campaign donations from US funders. We have no idea if Banks went ahead and attempted to fundraise in the US. We know only that it would have been illegal for him if he had. Using foreign money in a British election campaign is against the law. Farage sits at the intersection of the key forces in a new world order. An order that the old formats can’t cope with. What we need to ask is whether a man closely allied to people like Bannon and supportive of Viktor Orbán should be allowed to amplify his propaganda unchallenged on our broadcast media. It’s the people who have studied the campaign most closely who are asking the most questions. Damian Collins, the Conservative MP leading parliament’s fake news and disinformation inquiry, has said that “the direct links between the political movements behind Brexit and Trump” urgently need investigating. The committee has called repeatedly for a Mueller-style inquiry. The government continues to ignore it. ‘What’s your question for Nigel?” the LBC producer asks me when, last Sunday morning, I call in. This time I’m “Sarah from Weybridge”, a true-blue voter disgusted with Theresa May’s Brexit betrayal. “I’ll get you straight on,” says the producer. And he does. It’s only later that I notice the date: 18 November. Exactly three years from when Arron Banks and Andy Wigmore launched Leave.EU’s campaign. From when they walked in the door of the Russian embassy and discussed gold and diamond deals. I’m not a ranting lunatic. I’m a journalist. Who’s been trying to ask questions for nearly two years. Nigel Farage declined to answer any questions put to him about subjects raised in this article.